Powers/Abilities: Bont had no super human powers, but he occasionally used Mutant Growth Hormone, which spiked his speed and strength temporarily while giving off a green glow from his eyes. (Daredevil II#66 (fb) - BTS) - During World War II, Alexander Bont lived with his girlfriend Lucy. (Daredevil II#66 (fb)) -Bont developed a name for himself as a mobster. He arranged a deal with the Nazis and, while collecting payment, noticed he was being followed. 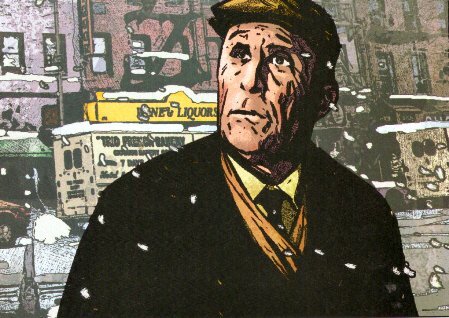 Trying to rush in receiving his money, he drew his gun just as the hero, the Angel, rushed in and scattered the Nazis. Bont tried running for it and managed to get the drop on the Angel. (Daredevil II#66 (fb)) - Bont rushed back to Lucy and learned that Lucky Luciano had been shopped out of the city. He showed her the diamonds they'd secured and told her of his plans to marry her and to take over Lucky's territory. (Daredevil II#67 (fb)) - Bont called a meeting with several of the city's criminals proposing that he be made head of the Kitchen. Joey argued that Bont was a traitorous vulture just before the Defender attacked them. As gunfire flew, Bont held a gun to the Defender's head and killed him with a shot, impressing the others. (Daredevil II#66 (fb) - BTS) - Bont received payment from several criminals in town, including the Fixer, a man who arranged fights and took bets. One of his allies in these days was Slick Saul. (Daredevil II#70 (fb) - BTS) - The Fixer murdered Battlin' Jack Murdock, a boxer who'd defied him, at Fogwell's Gym, a building Bont owned. (Daredevil II#67 (fb) - BTS) - Bont became involved in a legal battle against the Clinton Apartments, tenants he'd tried pushing out of their leases, who were represented by Foggy Nelson. (Daredevil II#67 (fb) - BTS) - Bont hired Melvin Potter, the costumed Gladiator, to do several jobs for him, including several murders. (Daredevil II#66 (fb)) - Daredevil, in his yellow costume, attacked Bont's guards in a restaurant while Lucy watched. Daredevil explained that the Fixer had named Bont and that Bont was going down. As Daredevil rushed away, the feds came in and arrested Bont, seizing his property. (Daredevil II#67 (fb)) - Bont tried hiring an up-and-coming lawyer, Matt Murdock, to represent him, but Murdock explained that he couldn't as Nelson's case would make it a conflict of interest. Bont furiously threatened Murdock, but shut up when he realized the conversation was being recorded. (Daredevil II#67 (fb)) - Released from jail and pursued by FBI agents, Bont approached Potter in his costume shop about taking down Daredevil. Though Potter was reluctant, Bont offered to give Potter the shop and to not turn him into the authorities if he did this job for him. (Daredevil II#68 (fb)) - While Bont flirted with one of the strippers in his club, Gladiator was tossed, unconscious, in front of the club. Daredevil taunted him from across the street as the police drove up. (Daredevil II#69 (fb)) - Bont was found guilty. As he was taken away by the police to jail, Daredevil sat on a wall, smugly looking at him. (Daredevil II#69 (fb)) - After years in jail, Bont read in a newspaper that Daredevil and Matt Murdock were the same person. As his release was coming up, he spent four thousand dollars on Mutant Growth Hormone (MGH), a drug that was supposed to grant its user temporary super powers. (Daredevil II#69 (fb)) - Bont, high on MGH, approached Potter in his costume shop once again. Potter immediately drew a bat to defend himself, but Bont held off the bat with his increased strength. He vowed to see Potter's daughter killed unless Potter dressed as Gladiator and brought him Daredevil. (Daredevil II#66) - Bont had a cab take him to his old neighborhood and he was overwhelmed by how much it had changed. He found his old restaurant as a video store now, and told this to an attendant named Maya. Bont soon watched Matt Murdock deny to the press that he was Daredevil, then visited Lucy's grave. Bont visited his old friend, Slick Saul, commented on how he was going to get revenge on Daredevil, then popped MGH and savagely murdered Saul. (Daredevil II#67) - Bont proudly watched Potter beat up Murdock. He ordered Gladiator to cut of Murdock's head, but changed his mind, wanting Murdock to pay even more. 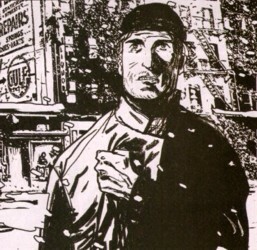 He was recording Murdock's humiliation. (Daredevil II#68) - Bont ignored Gladiator's requests to just let him finish things. He ordered Gladiator to toss Murdock out into the street, explaining to Murdock that at age 93, this was all he had left to live for. (Daredevil II#70) - Bont shouted out to the civilians to look at Murdock beat up, while Gladiator watched. With several people watching, Bont ordered Gladiator to execute Murdock, but Angela Del Toro of the FBI leapt in and knocked him backward. While Gladiator held her back, Bont ingested more MGH and attacked Murdock at Fogwell's Gym, where his father had been murdered. He soon suffered a heart attack and passed away. Comments: Created by Brian Michael Bendis and Alex Maleev. Alexander Bont could be one of the Ticket Box Robbers in the Doctor Grimm story. 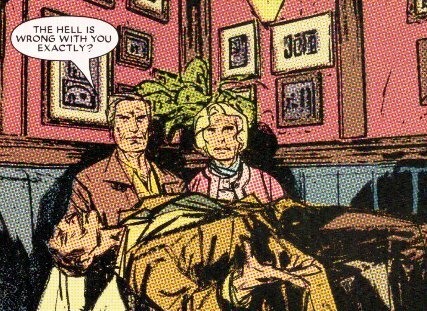 Plus could the Golden Age Angel's unidentified gang boss in Marvel Mystery Comics#8 (June, 1940 ) ("The Captive In The Cabin") be Alexander Bont? Even if he was captured he could have escaped before he reached Police Headquarters. Bont received an entry in All-New Official Handbook of the Marvel Universe#2. 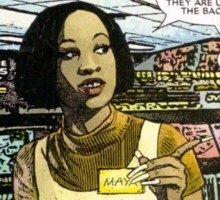 (Daredevil II#66) - A video store employee, Maya offered to help Alexander Bont, who told her the place used to be a restaurant.